Fuji's new FinePix F70 EXR is the worlds smallest camera to feature a 10x optical zoom (Oct. 2009). 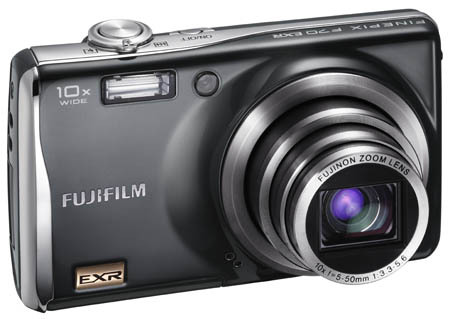 It also offers Fuji's new 10-Megapixel, Super CCD EXR imaging sensor, an their Real Photo Processor EXR. These features combine to give you high quality photos along with excellent performance. Fuji's new Super CCD EXR imaging sensor uses a new pixel layout with larger pixels that lay closer together than on a standard sensor. This allows for the sensor to capture more light faster than ever before. The sensor is able to operate in 3 specific modes: High Resolution, Wide Dynamic Range, and High Sensitivity and Low Noise. EXR Auto mode chooses one of these modes and then combines it with the proper scene mode to create one of the best auto scene selection features on a camera yet. The F70 EXR's processor allows it to not only to control the imaging sensor, but gives it the ability to take and combine multiple shots on the go. There is a pro-focus mode that simulates an out-of-focus backround by taking 3 images and combining them to give you the proper effect. Pro-Low Light mode combines 3 images to reduce the amount of noise in the image. It also allows you to take these images much faster than using a long, manual exposure. Finally there if a Film Simulation mode that captures 3 images that simulate Fuji's Provia (standard), Velvia (vivd) and Astia (soft) films. Available now with a MSRP of US$279.95.